This post was published just after 7:30am from my home at Indian Lake Estates, FL. Yesterday I enjoyed a great swim, an ice bath, a productive but relaxing day of work, and another good night’s sleep. This post, which took me about 1 1/2 hours to prepare, marks 250 consecutive days with a new enjoyable and educational blog post. 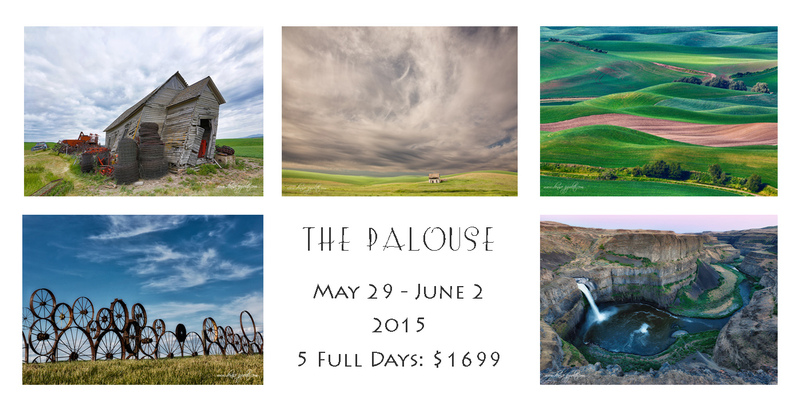 This 3-frame in-camera Natural HDR image was created on last spring’s Palouse exploratory trip with the Canon EF 24-70mm f/2.8L II USM lens (hand held at 25mm) and the Canon EOS 5D Mark III. ISO 400. Evaluative metering (+/- 2 stops around) +1 stop as framed yielded a base exposure of 1/500 sec. at f/14 in Av mode. Color temperature: AWB. Central sensor/AI Servo/Surround Rear Focus AF on the grey barn and re-compose. Click here to see the latest version of the Rear Focus Tutorial. Click on the image to see a larger version. I made the image above as a teaching tool after we had spent about a half hour using longer lenses to extract various elements of the scene that we all had found interesting. In the blog post of Tuesday August 5th, the featured image was an In-camera Art Vivid HDR. The 3 images in that HDR series were created +/- 2 stops around a base exposure that was created with an EC (exposure compensation) of +2 stops. The 3 images for today’s In-camera Natural HDR were created +/- 2 stops around a base exposure that was created with an EC (exposure compensation) of +2 stops. Note that both images were of similar overall tonality and were created in similar lighting conditions. Why +2 stop of EC for the base exposure of the ART Vivid HDR but only +1 stop of EC for the Natural HDR? While I do not know the technical reason or reasons for this, but experience has shown that you need to add a lot more light to an In-camera Art Vivid HDR than you do to an In-camera Natural HDR in order to wind up exposing to the right in the histogram for the final result, the 61mb JPEG. First let me say I love this type of teaching tool. Thanks for providing. I would take multiple overlapping images with a lens length long enough to allow me to place the green field in the lower left corner of the photo. I would remove at least half the sky, let the right side of the image end somewhere close to the tree on the ridge to eliminate a lot of the dirt in the lower right of the posted image. I would play with the natural landscape curves to see which part of the image is stronger. I would stitch the pano in software and add some NiK filters and maybe a little glow. I would step to the left maybe 10 feet to move the barn with white roof away from the LH edge of frame. I would crop from the bottom so the line formed by edge of crop intersected with the LLH corner of the frame. I would then crop from the top to form 16:9 or maybe 2:1 pano to remove a lot of the sky. I might then pull out some long glass and focus mid frame on the intersection of the green hill and the ploughed land just to the right of the grey barn. There is some nice rolling hills there that would make a nice study of textures and light n shadows.. I also like the tree mid frame LH edge ( as per greg post above) and the diagonals behind it..
First off I love your work and your teaching. The thing I see in this images is the jet trails in the sky and I would cut down on so much sky. It almost creates two images. What would you think if you cropped down from the top and only left a few inches of the sky? Love these teaching tools. It’s fun doing them and I learn a lot. Thanks for them…..
-horizontal. 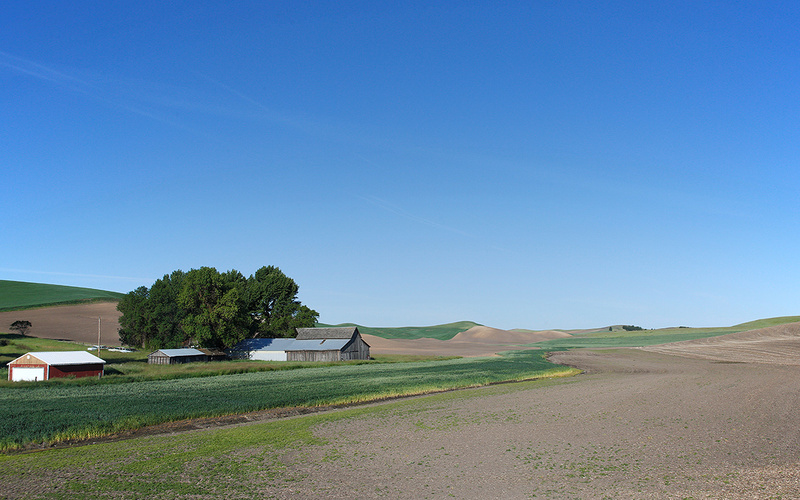 Pano of hills in middle keeping a narrow band of blue sky. Exclude bare earth below. -maybe some blurs on the green stalks with yellow bases. ps: in this situation we had to stay on the road; we were not free to approach the buildings or to walk into the fields. Two that I see first would be to isolate the small tree in the far left against the background of the hills. Keeping it in a corner of the frame I think could be nice. I also like the center portion of the hills with the wavy lines of color change from green to brown. I think this could work both as a “normal” image and a pleasing blur. If you could change perspective, I would shoot the front of the older barn with the green trees behind, isolating from the other buildings.